NASA managers Saturday decided to delay launch of an Orbital Sciences Corp. space station cargo ship by at least one day amid ongoing work to come up with a fix for a balky valve in a cooling system that has forced the station crew to power down non-critical systems. Extensive testing indicates the valve has suffered a hardware failure and while engineers haven't given up on finding a fix, officials said, the station astronauts are protectively preparing spacesuits and other gear for at least two potential spacewalks to install a replacement ammonia pump module. No final decisions have been made, but if the spacewalks are required they likely will be targeted for Dec. 19 and 21, with a third excursion held in reserve Dec. 23 if more time is needed. If the spacewalks are ordered, Orbital Sciences would delay launch of the company's Cygnus cargo ship until early to mid January. "It's a serious problem, obviously it's something we have to fix," station astronaut Rick Mastracchio told a reporter Friday. "It's not something I'm worried about, though. We've got some great folks on the ground, and I wouldn't be surprised if they can figure out a way to get this external (coolant) loop back up and working in the next couple of days. "And if they don't, then the possibility exists we'll have to go out and do a spacewalk to replace the pump module. We have many spare parts on board, we train for these situations over and over again, so all the procedures and everything are in place to take care of this." Hoping for the best, Orbital Sciences engineers at the Mid-Atlantic Regional Spaceport at NASA's Wallops Island, Va., flight facility are pressing ahead with plans to roll an Antares rocket and Cygnus cargo capsule to the pad 0A on Tuesday, setting the stage for launch at 9:19 p.m. EST (GMT-5) Thursday, one day later than originally planned. If the launch goes forward, the station crew will use the lab's robot arm to berth the cargo ship to the forward Harmony module's Earth-facing port on Sunday, Dec. 22. But that assumes engineers can resolve the cooling system problem that has left Harmony and two other modules in power-down mode. At issue is the behavior of a flow control valve inside a pump module housed on the right side of the station's solar power truss. The valve is used to regulate the temperature of ammonia coolant used to dissipate heat generated by the station's electrical systems. The station is equipped with two independent ammonia coolant loops and while either one can handle the heat produced by the station's critical life support, communications, stabilization and key computer systems, both are needed to cool those components, the station's major science experiments and other non-essential equipment. The flow control valve problem resulted in lower-than-allowable temperatures in the ammonia flowing through coolant loop A. That's a major problem because the ammonia picks up the heat generated by the lab's electrical systems from warmed water that flows through heat exchangers. The concern is that the cold ammonia could freeze the water in the heat exchangers and damage the system. As a result, flight controllers opted not to use loop A, switching critical systems to coolant loop B and powering down non-essential equipment in the Harmony module, the European Space Agency's Columbus laboratory and Japan's Kibo research module to reduce the cooling required. Overnight Thursday, flight controllers power cycled the loop A pump module, hoping that the flow control valve, located in the module's plumbing, would reset and work normally when the system was powered back up. But valve showed the same behavior as before. Engineers then carried out tests using a different valve at various settings to achieve the proper temperature in loop A with the flow control valve locked in the wrong position. The results of those tests are being evaluated, along with other possible methods for regulating the ammonia temperature with a malfunctioning flow control valve. But insiders say it appears increasingly likely that a spacewalk repair job will be needed to restore coolant loop A to normal operation. If so, the task will fall to Mastracchio, a veteran spacewalker, and first-time flier Mike Hopkins. 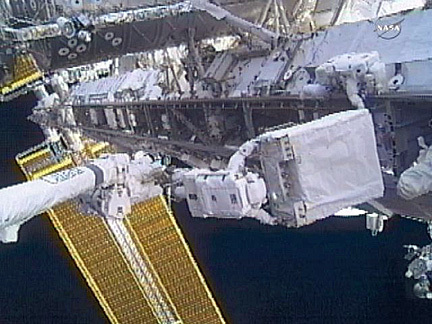 Both had training for a pump module swap out before launch -- three spares are mounted on storage pallets attached to the station's power truss -- and they will have the advantage of lessons learned from three 2010 EVAs to install the pump module that is now having problems. "Any spacewalk is challenging, obviously, and there's risk involved," Mastracchio told Space.com in an interview Friday. "This particular pump module R&R, we've practiced it many times in the (training) pool, I did an ammonia tank change out three years ago during one of my shuttle missions. This is very similar, a large box, a few bolts. "The biggest challenge on this spacewalk, in my opinion, is the large fluid connectors that are connected to the pump module. But of course, we have a lot of tools if we have problems with those to fix that." During spacewalks in 2010 to install the current pump module, astronauts ran into trouble with those connectors and had to add a third spacewalk to complete the swap out.